The District has a five member Board of Supervisors, all of whom are residents of the District. These Board members are elected for four year terms and the Chairman is then elected by the members of the Board. The District has a staff of over 40 people for general District services and water and wastewater services. Board members and District staff are subject to Florida’s Code of Ethics for Public Officers and Employees, Part III of Chapter 112, Florida Statutes, online at http://www.leg.state.fl.us/Statutes/index.cfm?App_mode=Display_Statute&URL=0100-0199/0112/0112PartIIIContentsIndex.html&StatuteYear=2014&Title=%2D%3E2014%2D%3EChapter%20112%2D%3EPart%20III. The water facilities include one reverse osmosis treatment plant, water storage tanks and approximately 64 miles of water transmission and distribution lines. The system has 3 raw water supply wells providing up to 4,200 gallons per minute of raw water from the Floridian Aquifer. In November 2005 the District placed a new reverse osmosis water treatment plant into operation. This new plant expanded the potable water treatment capacity of the District from 2.1 to 3.4 million gallons per day (mgd). The water treatment plant now has permitted capacity of 3.4 mgd to service a total of 6,740 water customers. 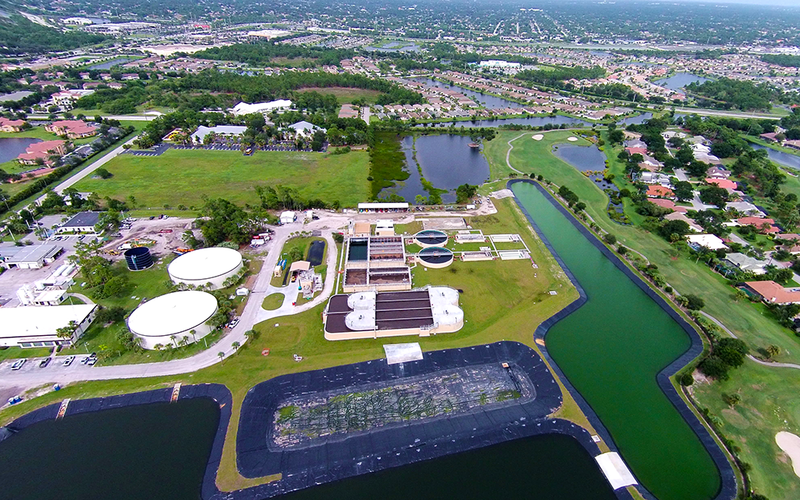 The wastewater facilities of the utility system include a wastewater treatment plant permitted at 2.0 mgd, approximately 53 miles of gravity sewer line, 22.5 miles of force main, and 18.5 miles of reuse effluent force mains. The wastewater system serves 6,740 customers. The District maintains an irrigation system to dispose of the highly treated water produced by the wastewater treatment plant. Once treated, it does not contain any active coliform bacteria, so bacteria sampling is performed four (4) times a week to ensure the water is of highest quality. The demand in SLWSD exceeds 500 gallons per day (gpd) per household, and since the sewage flow totals only 150 gpd the difference is made up by drawing water from several lakes (storm water retention ponds) within the District, Plans are underway for future expansion and modifications to the irrigation system that will provide the community with a higher per day gallon flow with better water pressure.